The Man from Madras Musings rarely writes about social media, chiefly because the Chief does not quite like these things. Neither does MMM, but then unlike the Chief he cannot afford to stay away from them either. There were many occasions when he was sorely tempted to write about the menace that lurks in these so-called aids to social connectivity, but he held back the typing hand and bade it to be still chiefly because he did not know what the Chief would say. But then, out of the blue, in the last issue, what should MMM see but an article on Alexa, the virtual assistant! What ho, said MMM to himself, the Chief is leapfrogging on technology. And so here is this piece on WhatsApp. It all began as a counter to SMS – remember the short messaging service we once used and for which we charged? WhatsApp was free and so everyone jumped to it. It also allowed for images, audio and video to be sent and so people jumped into it even more. Gone were the days when for the birthday of the Elephant-headed God you worked out a complicated greeting of dots and dashes that was shaped like His trunk. Now you just needed to select a photo of said God from Internet, paste your text and send it to all your relatives, and friends, and acquaintances, and even those you did not know. There was a simpler way out too – just forward someone else’s greeting. There are some people whom MMM knows who in his view do little else other than forward WhatsApp messages. They send flowers and good morning wishes in the morning, audio and video clips during the day, fake news by evening and then good night wishes with more flowers by night. MMM is quite curt with these specimens and by phone calls, messages and emails, has managed to get most of them to stop. And just as he was heaving a sigh of relief, along comes this musician who is more of a teacher today than a performer. MMM believes he has an extensive student following all over the world. MMM and musician were duly introduced and exchanged phone numbers. And that was that. Only, that was not just that. From the next day, MMM was blessed to receive a benediction from this man each morning. If it was a Monday, the message would read Happy Monday and be accompanied by a picture of a deity. If it was Tuesday, it would say Happy Tuesday and have yet another deity appended. MMM suffered this for a fortnight and then mustered the courage to send a politely-worded message to musician asking if the nuisance could cease. The reply was prompt – the musician, said the musician, was most sorry. He said he appreciated MMM‘s problem and would make amends. It was just that he needed two days. Why, asked MMM. The answer was rather sheepish – the musician, said the musician, knew how to add phone numbers to this list, but did not know how to remove them. There followed two days of agony wherein MMM received more blessings and pictures of Gods. He then made bold to reiterate his request. This time the answer was most apologetic – there had been no progress in identifying the way to remove MMM‘s number. Would MMM mind if therefore the musician blocked MMM‘s number as that appeared to be the only way out? Mind? MMM was delighted. That ended the problem and all is well. MMM and musician are at peace. But it still amazes MMM that people add you to random lists without so much as a by-your-leave. Now that it has solved all problems facing our State The Man from Madras Musings notes that the Government, such as it is, has moved on to matters of greater pith and moment, namely the commemoration of the original matinee idol who founded the party in power. First on the anvil is a commemorative arch that is to come up (where else?) on the Marina. It will in time keep company with other memorial arches on the same stretch – the University 150-year arch, the Legislature Diamond Jubilee arch, the Napier Bridge which is a series of arches, the Anna Memorial that has an arch and the strange two-leaf- turned-upside-down arch that fronts the original memorial to the matinee idol. To what purpose a memorial arch when the leader already has a far-too grandiose and grotesque a memorial in the same place is a matter to ponder over, only for those who are not party to such decisions. Even more ridiculous is the decision to rename Central Station after matinee idol. It will therefore be Matinee Idol Station pretty soon, keeping company with Former-Prime-Minister-of-India General Hospital, which chugged along for years without that wholly unnecessary prefix. 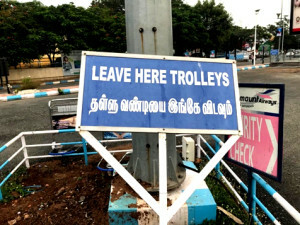 MMM hears from insiders that the principal argument put forward in support of this wholly unnecessary renaming was that if Bombay (sorry Mumbai) could rename Victoria Terminus after Chatrapati Shivaji, then why not Chennai do the same with Central. To this, MMM has only one counter – Central was not the name of any colonial King Emperor or Queen Empress. It merely indicated a location. Why this rush to name the station after Matinee Idol who left us all in deep sorrow over three decades ago? Apparently, the fear among those in power (yes we all know the old adage – uneasy lies the head that wears the crown, even if it be in this instance only half a crown) is that there was considerable loss of face over the fracas leading to the burial at the beach of the Old Man in the Opposition. It is felt that these acts of renaming and arch building could result in gaining of some lost ground. Be that as it may, our beloved Central will soon join the long list of places, roads, buildings, colleges, schools and other what-have-you that are already named after Matinee Idol. MMM wondered about the silence of the opposition when it came to this decision. Eternal Youth Leader, thought MMM, would surely have had something to say over this. And then it struck MMM – EYL too has a late-lamented leader to commemorate. He must be earmarking the Egmore Station for this honour, or who knows, the eternally-in-planning-stage international airport that is supposed to be built somewhere. If not anything else, he can surely manage a commemorative arch on the Marina. The Man from Madras Musings must confess this is not a picture from our beloved airport, which is such a celebrated structure across the whole world. It is from the industrial city down south in our State. Walking out of the airport there MMM could not help clicking this deeply philosophical message.